So many frustrated yoga teachers out there, on a warparth against any body who truly loves yoga.. 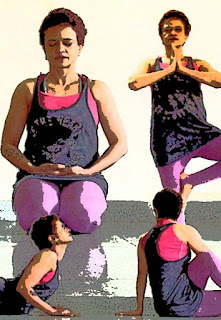 It is a puzzle to me how yoga `' lovers' (ha, ha) become idiotically possesive about yoga.. If I loved the sky and u loved it too, do you have more right over it? It is intriguing to me, this attitude. I am not responding, so please don't start lecturing me about it (some people start that too, on this blog and think I am reacting to these things. If I did, would I by writing there still and for so many years?!!! ). I am merely observing, objectively, the violence of their attack on me!! I love yoga, why is it bothering so many people?!!! "Sahanam Sadhu Dharma ". A true believer does not react to bouguets or brickbats. But our experience of a stable outside world is a consistent illusion that the brain creates. It is an illusion that has been `designed' long before we arrived on earth, for the purpose of biological survival. The illusion begins at the first neuron. Our senses grab only a little of reality; the eye takes in a trillionth of the energy which reaches it, the ear similarly. So, our experience of the world as stable is so because of the way the brain is organized, not because of the way the world is. From The Healing Brain, by Robert Ornstein and David Sobel. Wanting to reform the world without discovering one's true self is like trying to cover the world with leather to avoid the pain of walking on stones and thorns. It is much simpler to wear shoes. Craving for what is savorless? though torrents pour from the clouds. Kabir. For more Kabir and his scathing wit, go here.